Enter Project FUEL, an organization dedicated to collecting life lessons. “I’ve always dreamt of collecting life lessons from an entire community. Considering India’s large migration problems, we decided to target a village facing issues revolving around the same. After looking up several villages in Uttarakhand, a state that is currently facing a large migration problem, we zeroed in on a village called Saur. The village is termed a ‘ghost village’ and has numerous articles dictating the same,” said Deepak Ramola, founder of Project FUEL. The thought of the village simply fading away, forever known as a mere ghost village saddened Deepak, and thus The Wise Wall Project, an initiative of Project Fuel sponsored by RoundGlass, came about. 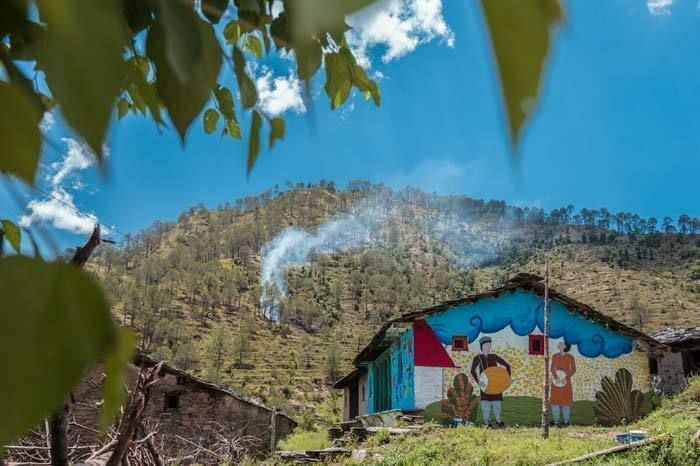 “An organization called DueNorth has been actively working to restore the village for ten years now, converting places into homestays and initiating arts and crafts with the local women. It seemed apt to build on their progress and take it from there.” The village previously housed a good 200 families, until several moved on for better job opportunities, leaving behind only 12 families. 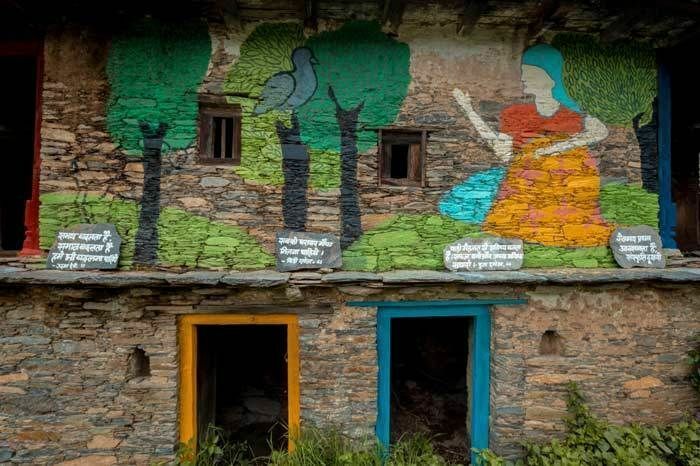 It was decided then, that the village’s life stories would be painted, making it the first village in the world to have an entire community’s lives exhibited on the exterior of every house wall. Head artist, Poornima Sukumar explains, “The whole village had a theme. We studied the history of the region and came across a story of the Mughal king Sulaiman Shikoh. He was exiled to this region, and had travelled with an artist and his son. The two stayed on, even after the king went back, going on to develop their own style in the region, called Garhwal painting.” After their indepth research on the same, popular Mughal patterns made their way on to the walls as well. While Deepak collected life stories, Poornima ensured they could be depicted visually, and had a visual impact as such. “Stories of how the community came together, whether it was to pray, celebrate, or even just eat, were essential to evoke the feeling of community that once was,” reiterated Deepak, as he goes on to tell us of his favourite wall paintings. Right up in the heart of the village, on a central wall lays a colourful wall depicting the village’s age-old method of communication. “Back in the day, every village head was given a radio by the Government. Akashvani Lucknow was the one the village of Saur tuned in to. The whole village would gather around to listen in on the daily news,” he continues. 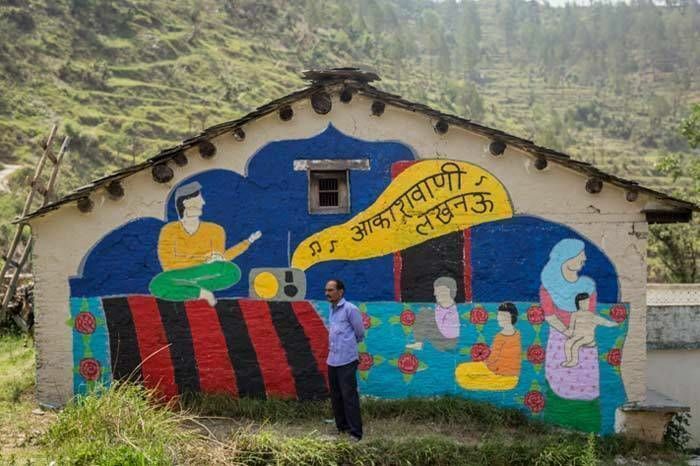 When the villagers noticed this painting, young and old, their faces all lit up, as it began to dawn on them that Project FUEL and their volunteers were here to do more than just ‘paint’. “Another favourite might be the tiger mural we painted. It was spread across five houses, and it was inspired by a famous tale back in the village. Years ago, the goddess they worshipped appeared before a man, telling him of a tiger who had a thorn stuck in his paw that needed aid. After discussing the same with the villagers, they agreed that he had to go help the tiger. As terrified as the man was, he crossed the river, found the tiger, removed the thorn and came back to the village safely. For a while after, the Goddess was said to have walked along the riverbed over the next few weeks—leaving behind footprints! While all this is folklore, the strangest thing happened while we were painting the tiger mural. One morning, just as we were nearing completion, a girl who went to collect grass came running back early in the morning, screaming about seeing a tiger. We all heard the growls and noises from the forest,” relayed Deepak, barely containing the excitement in his voice. 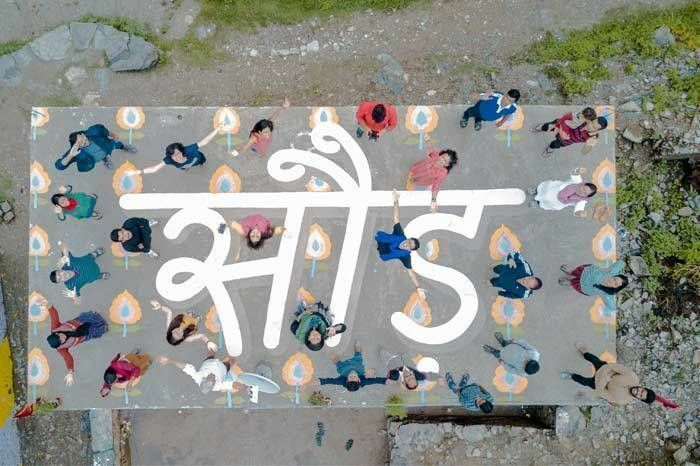 Niteesh Yadav, a typography artist even contributed to the project — going as far as studying the handwriting of the remaining 12 families, to create a whole new ‘Saur’ font, instead of sticking to the typical devanagiri (Hindi) font. Other artists who dropped in to share their love of art across Saur’s walls include Laila Vaziralli, Neerav Doshi and Ghana. “It’s surprising how often we let the complexity of our lives, outshine the simplicity of it all. While we were there, the villagers let us in on so many life hacks, it was amazing! We’ve even used the bark of the Bhimal tree, as a replacement for shampoo and conditioner—and it worked wonders! Knowledge is wealth, and rural knowledge as wealth has been completely sidelined in our commercialized life,” Deepak voices vehemently, an opinion many share today. So when you’re planning a trip next, perhaps take one off the beaten path. With homestays and walls whose vibrant colours bounce off the walls telling tales that would’ve been lost to the ages, is a mountain escape like no other. The whole experience was documented by Vibhor Yadav and Sabit Tisekar. All the photographs (including the feature image) used in the article are by Vibhor Yadav.